Bank of America Corp. and Citigroup Inc. incorrectly hid from investors billions of dollars of their debt, similar to what Lehman Brothers Holdings Inc. did to obscure its level of risk, company documents show. In recent filings with regulators, the two big banks disclosed that over the past three years, they at times erroneously classified some short-term repurchase agreements, or "repos," as sales when they should have been classified as borrowings. Though the classifications involved billions of dollars, they represented relatively small amounts for the banks. A bankruptcy-court examiner said Lehman had been doing the same thing to make its balance sheet look better before it filed for bankruptcy in September 2008, using a strategy dubbed "Repo 105" that helped the Wall Street firm move $50 billion in assets off its balance sheet. Just an innocent mistake--and BAC number is $70, $60 or $50 billion the last three quarters. But to banks, with Turbo Timmy as their best friend, that's just a rounding error!! What's your thoughts around M3 contraction and potential implications? peeler--M3 contraction? the grapevine rumor is that you'll soon be helping it in a big way!! Then gold should swell too right? 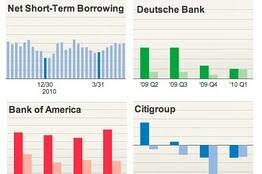 Hi I work in the industry and I think it’s important to note that SEC Chief Accountant James Kroeker said last week that they hadn’t found evidence of balance sheet management being widespread (http://www.webcpa.com/debits_credits/Finance-Execs-Fret-over-Accounting-Standards-Overload-54317-1.html) and now less than a week later the Wall Street Journal (http://online.wsj.com/article/SB10001424052748704792104575264731572977378.html?mod=WSJ_Markets_LEFTTopNews) is reporting that Bank of America Corp. and Citigroup Inc. used balance sheet management, including the use of repo agreements. The SEC also asked 19 other firms to clarify its usage of balance sheet management practices. It is clear that the SEC is trying to marginalize a small number of firms in order to avoid criticism of failure to cover balance sheet management in the past.